This Sunday night, Award Season kicks into high gear with the 2017 Golden Globes. I have great jewelry expectations for the evening based on all the splendor we have seen at the premieres for the nominated movies. The Adventurine team is heading west for the duration of Award Season to be close to the jewelry action. Before jumping on a plane, I made a few predictions for six of the nominees who we are most likely going to follow right up to the Oscars with the successes of their films. Check them out below and see how many I get right. Follow me on Twitter @theadventurine Sunday night and join in the jewelry conversation live. RUTH NEGGA A newcomer to Award Season, Ruth Negga, who is nominated for a Best Actress Golden Globe for her role in the drama Loving, has been handling her premieres and red carpet appearances like a pro. The dresses and jewelry the Ethiopian-Irish actress has chosen have had just the right amount of edge to get her noticed every time. Negga has been consistently shining in pieces from the most amazing jewelry collab of 2016, the Gemfields x Muse collection. 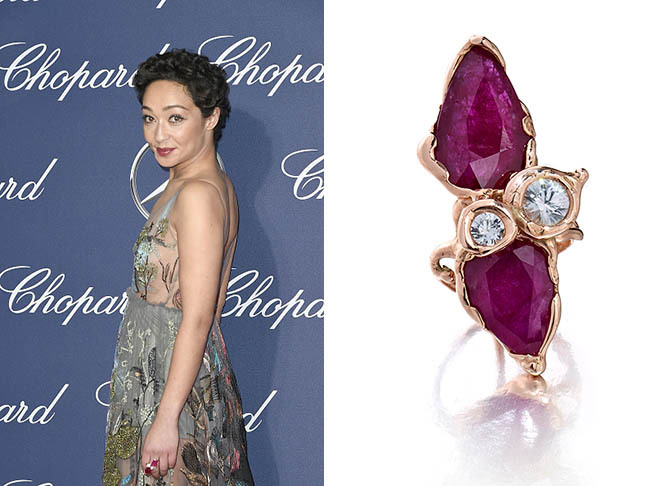 At the Palm Springs International Film Festival, she put on a fetching Gemfields ruby and gold ring by Lucifer vir Honestus from the collection. For People magazine’s Ones to Watch party she wore the Gemfields x Muse emerald Cyclos ring by Elena Votsi and Portrait ring Holly Dyment. At a photo sesh for The New Yorker, she put on the same jewels. Most recently Negga was photographed in a glorious Nikos Koulis ‘Oui’ necklace set with Gemfields’ gems. For the Golden Globes, I feel confident Negga will go to the same source for jewelry. 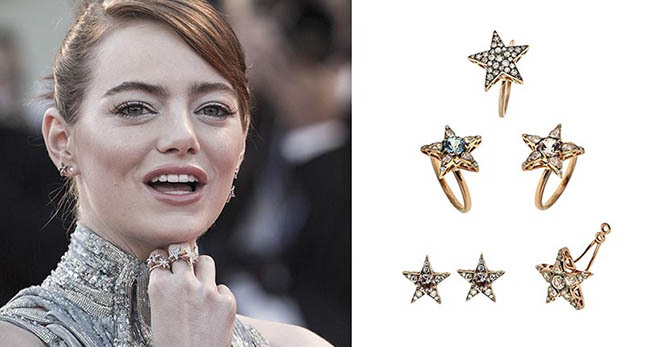 EMMA STONE A total wild card, Emma Stone has chosen jewels from several different designers for her red carpet appearances promoting La La Land. The Best Actress nominee started at the Venice Film Festival in August wearing Selim Mouzannar for the red carpet and Jennifer Meyer for the press conference. At the AFI screening on November 15, Stone sparkled plenty in diamond earrings by Anita Ko. She wore Cartier at Critics Choice Awards. 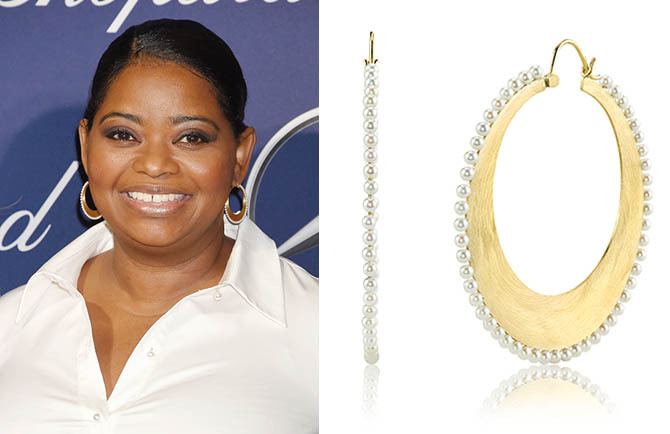 Monique Paean, one of the jewelry designers she wore in the movie, was her choice for December 6 opening of La La Land in Los Angeles. What the actress will wear at the Golden Globes, really is anybody’s guess. If I am hard pressed, I can’t guess. Stone rarely repeats herself in the jewelry department. 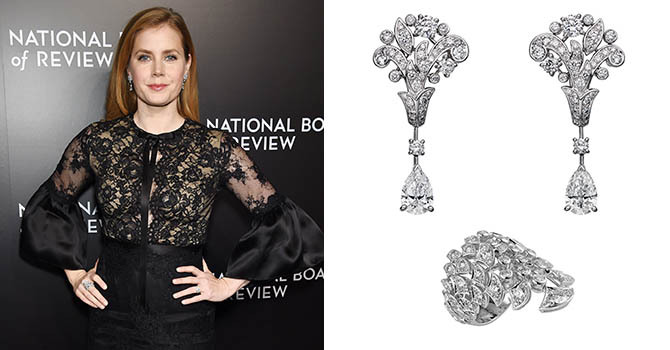 AMY ADAMS The red carpet veteran wore lots of great jewelry in the Tom Ford film Nocturnal Animals. Her Golden Globe nomination is actually for her part in Arrival, but I feel she is taking her style cues from the haunting Tom Ford drama. I mean just look at her chicness above. Lately, on the red carpet Adams has been wearing Cartier almost exclusively. She sported some vintage and contemporary Cartier at a November screening of Nocturnal Animals. At the Palm Springs International Film Festival it was Cartier again, gold jewelry including one of the new Cactus rings. 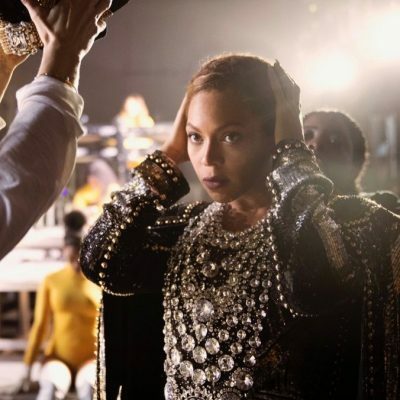 At the National Board of Review she wore diamond and platinum earrings and a ring from Cartier’s High Jewelry selection. For the Golden Globes, I think it’s safe to say Cartier is going to be the jewelry designer for Adams. Let’s hope she delves into the heritage collection and pulls out something like the pieces we saw on the stars at the reopening of the Mansion in New York. Hidden Figures, the film Octavia Spencer is nominated for a best supporting actress Golden Globe, was only released on Christmas Day so there have not been as many red carpet moments as the other stars have had for their films that debuted months ago making it difficult to guess just what direction she is heading in or designers she currently favors. At the Palm Springs International Film Festival, Spencer stepped out in a very strong look. It’s worth noting she is one of the few who actually dressed in the manner of the locale. Spencer stylishly paired a white shirt with a printed skirt and stunning gold and pearl hoop earrings by Irene Neuwirth. It all instantly gave me flashbacks to Octavia’s epic 2012 Award Seaso nwhen she won everything for her role in The Help, dazzled on each red carpet and left us all in awe with her moving acceptances speeches. Guessing what she may wear on Sunday, I say Irene Neuwirth. She has worn Irene’s jewels in the past so there is some history to choice of the jewels. Feels like she might have spotted these hoops while she was on the hunt for a bigger piece and put that bigger piece aside to wear at the Globes. If there is one jewelry certainty for the Golden Globes red carpet, it’s that Jessica Chastain will wear Piaget. The actress, who is nominated for her role as the tough as nails lobbyist in Miss Sloane, is the face of the Swiss jeweler. She loves Piaget so much she even incorporated some Piaget jewelry and watches into the film. Jessica’s familiarity with the collection results in beautiful jewelry red carpet moments. 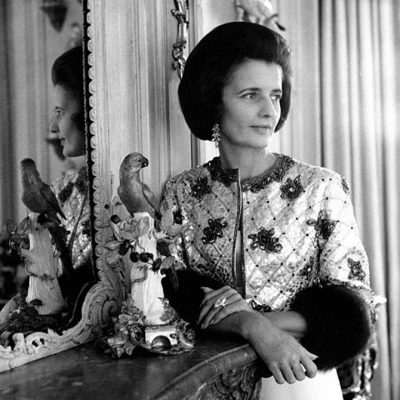 She often wears the most daring pieces Piaget.